The desire and capacity to linger in joy, beauty and truth is liturgically not easy to do these days with the absence of octaves following a major feasts. Eight days are not too long, not too complicated, not too esoteric to extend our prayer! And I don't mean to merely lament the ansence of an official 8-day period of liturgical prayer. The Church has retained the octaves of Christmas and Easter but the rest are sadly gone. At least for now. I think it was a colossal mistake of the reform of the Missal by Pope Paul VI to jettison the octave, especially the octave of Pentecost. How often do we need to slowly meditate on the Gifts and Fruits of the Holy Spirit and beg for the grace to integrate grace into our lives. We need the opportunity to understand concretely the action of the Spirit in our lives and we need to hear the beautify music, poetry and preaching connected with the Pentecost's octave. 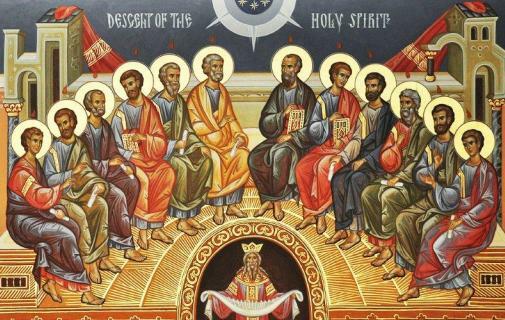 The Pope even he wepted when he realized the change he made without thinking the whole thing through; the implications are significant; the absence of the Pentecost octave is diasasterous event for the Church. Why is it problematic? It is so because we are Church, a people of the Way, who rely on the Holy Spirit to guide each-and-every step we take in living the Gospel and seeking the face of God. I share the opinion with many others that one of the re-reforms of the Missal that still needs to be investigated is the restauration of the Pentecost Octave. However, I would also advocate the implementation of the Assumption and Epiphany octaves. Apparently, I am not alone: the editor of America magazine Jesuit Father Drew Christiansen is saying the same thing and he's quoting a friend, Benedictine Father Mark Daniel Kirby in his "Of Many Things" article this week. The Roman Church celebrated Pentecost last weekend thus concluding the Easter season. This weekend the same Church observes the feast of the Most Holy Trinity. 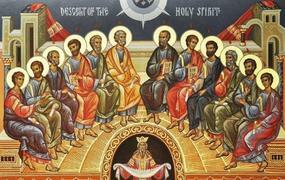 Also this weekend, our Orthodox sisters and brothers are celebrating the Coming of the Holy Spirit (see Acts 2:1-4). Let us beg for the gifts and fruits of the Holy Spirit. You may read more about the Spirit's feast here. This page is a archive of entries in the Easter, Ascension & Pentecost category from June 2012. Easter, Ascension & Pentecost: May 2012 is the previous archive. Easter, Ascension & Pentecost: March 2013 is the next archive.